Sauerkraut might not be the national dish of Germany, but in the U.S., it is the one food most associated with German cuisine. With this easy recipe, you can adjust the yield to your liking because each batch ferments in a 1-quart Mason jar. 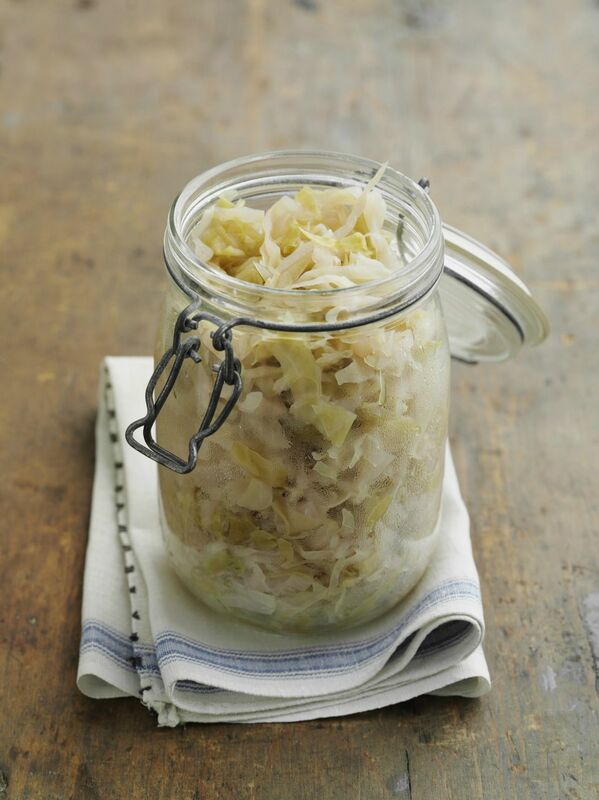 To make your own sauerkraut, you will rely on the bacteria found on the cabbage leaves. The salt draws out the water, kills off the spoilage bacteria, and fermentation begins. You will need a salt concentration between 0.6 and 2 percent, which equals 3/4 to 2 teaspoons of table salt per pound of prepared cabbage. It can take anywhere from one to three weeks to achieve a nice sour tartness in your sauerkraut. In the cool temperatures of winter, it will take longer, and in the warm days of summer, it will go more quickly. Canned sauerkraut should be rinsed in a colander before eating to reduce the briny flavor, but fresh sauerkraut like this one does not have to be. Enjoy low-calorie sauerkraut raw, right out of the jar as is, as a garnish, or salad, or cooked with apples, bacon, and onions. In a clean, non-metallic bowl, mix together cabbage, juniper berries, caraway seeds, mustard seeds, and pickling salt. Stir the cabbage to release its juices. Let it rest 10 minutes and then mix again. You might let this rest longer, as much as 1 to 2 hours, if needed. Sterilize a 1-quart wide-mouthed Mason jar and lid by boiling for several minutes in water and draining on a clean dishcloth. Pack the cabbage and seasonings into the sterilized jar, pushing down with a wooden (not metal) spoon. Add the filtered or non-chlorinated water that has been mixed with pickling salt (1 teaspoon pickling salt per cup of water) up to the rim of the jar and cap loosely with a sterilized canning lid. Place the jar on a tray to catch overflowing juices. After bubbling stops, check the container and top off with salt water (1 teaspoon pickling salt per cup of water, warmed slightly to dissolve completely) if the level falls below the rim. Keep the jar between 65 F and 72 F for one to three weeks to achieve a pleasantly sour flavor. After the first week, taste the sauerkraut every few days until it reaches the tartness you desire. Then skim any (harmless) white spots or film from the top, close the jar tightly with a sterilized canning lid and ring, wipe off the outside of the jar, and store in the refrigerator until you use it up. Note: Using pickling salt, a fine-grained salt that has no additives, will keep the sauerkraut liquid from clouding, which in itself is not harmful, but creates an unappetizing appearance. Sauerkraut in German means "sour cabbage" and it came to Europe from Asia, where it was the go-to dinner for laborers building the Great Wall of China more than 2,000 years ago and made by fermenting cabbage in rice wine. It is believed Genghis Khan first brought it to Eastern Europe about 1,000 years ago, and salt was used in place of wine to start the fermentation process. After this new taste sensation caught on, it found its way to Germany, France, and beyond. When nutritionists discovered the high vitamin C content of sauerkraut, it quickly became standard fare for long sea voyages because it didn't need refrigeration and helped to prevent scurvy. For landlubbers and farmers, sauerkraut became a way to preserve a vegetable for consumption throughout the winter and in times of drought and famine when crops weren't producing.